If you find that some of your best ideas and insights are generated in the tranquility and solitude of the shower...then AquaNotes® is for you! 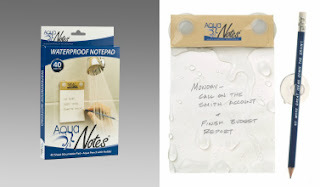 These waterproof notepads help you capture and preserve your ideas before they're forgotten! Families are on the go more than ever! 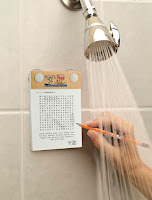 AquaNotes® provide a way to use the shower to organize your thoughts, to-do-lists, and errands for the day ahead. Leave reminders and messages for family members or relax by drawing, sketching, or doodling in the shower! 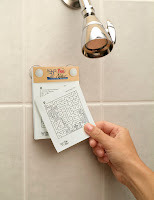 Give your favorite student a fun gift that can help put their long showers to good use! 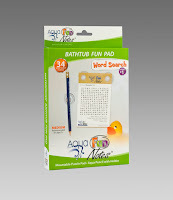 They can use AquaNotes® to preserve those great term paper or class project ideas, organize thoughts and tasks for the day ahead, or to leave messages in the shower for roommates! Or they can draw, sketch, or doodle in the shower! 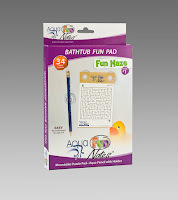 1 - Pad of Aqua Love Notes Leave a note for that special someone! A fun way to leave romantic messages, encouraging words, or appreciative sentiments. 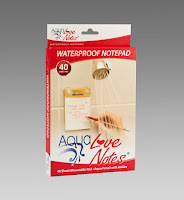 Shower Your Loved Ones With LoveNotes® Great Bridal Shower or Wedding Gift.